In the SEO world, the only thing that matters is beating out your competition. That’s really all that Search Engine Optimization comes down to if you think about it. Google and other search engines are going to rank the site they feel is the best fit for a given search phrase. 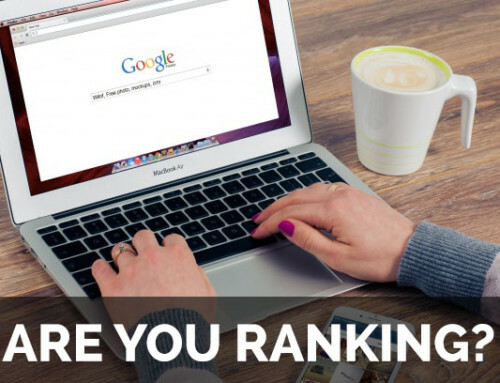 Your goal is to be better suited to rank for that search phrase than any other website. 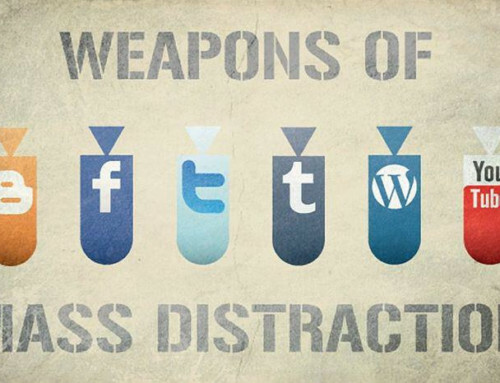 But how do you know exactly where your website fits in with rest of the crowd? I’m going to show you how you can see your current online standing using free competitive analysis tools. So, now that we know the reason behind looking at our competitions online presence (and our own), we need to know exactly what to look for. 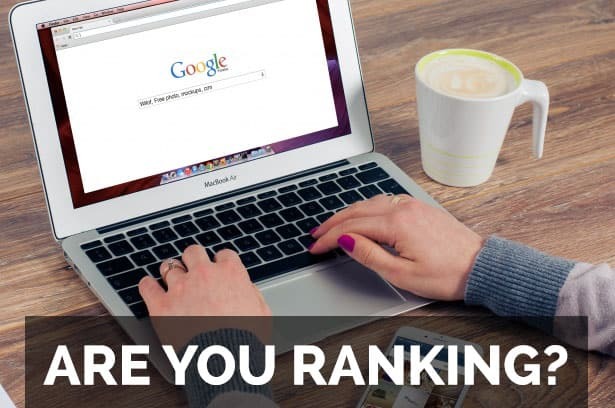 I will do my best to explain in simplest terms the things you want to look for when determining why a website is ranking where it is ranking in Google specifically. In most cases, what applies to Google applies to other search engines. Google has explicitly stated that there are over 250 factors that are taken into account when determining where to rank a given web page. It’s important to note that Google ranks pages and not websites, that’s a common misconception but important none the less. So, rather than focus on 250 different aspects for each page that we want to rank, we narrow it down to the most influential “signals” that Google picks up. If you have ever heard of the 80/20 rule, it’s something I like to apply to SEO and I’ve found that it works really really well. Basically, the rule states that 20% of your efforts or input will account for 80% of your output or results. Applying this to SEO would dictate that 20% of Google’s ranking factors account for 80% of results and I find that to be true time and time again. So, rather than looking at every little detail of a website to see why it’s outranking our website, we are just going to focus on the core signals that Google takes into consideration when it’s determining where to place a web page in the search results. Google places an authority on every domain that it indexes and this authority is based primarily on the links coming to that domain from other websites. 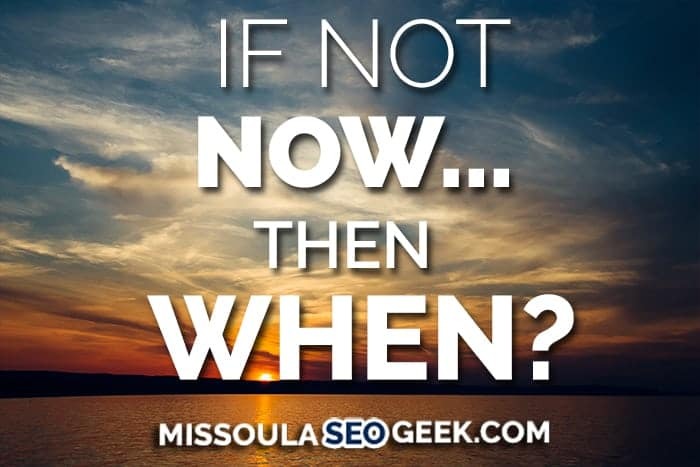 If you imagine that my business, Missoula SEO Geek, gets featured on nytimes.com in an article because I’m so great at what I do and they put a link at the bottom that points to my homepage, Google is going to see that as a sign of major trust. So, how do we find out what the authority of our domain and our competition’s domains are? 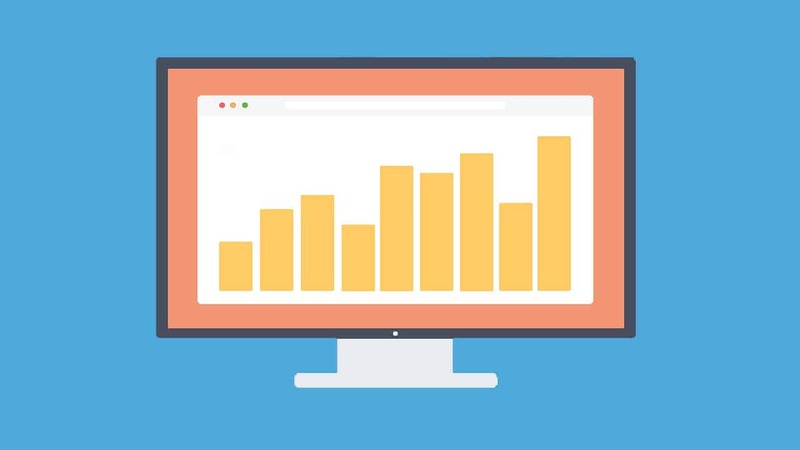 Well, I really like to use this free Website Authority Checker which gives you a number of valuable statistics that will help you tell why a website is ranking where it is. I visited that link and entered my domain (http://missoulaseogeek.com/) and these are the results. You can see in the image below that it shows the DA or Domain Authority of the website as well as the domain’s age, and the number of backlinks the domain has. Let’s dive into domain authority a little more before we go onto domain age and links. The domain authority will be a number between 1 and 100 with a value of 100 only going to the top websites online like Google, Facebook, Youtube, etc. This is all based on a logarithmic scale which means the closer you get to 100 the harder it is to move up. So, going from 1 to 10 is a lot easier than going from 60 to 70. It shows that my current domain authority is 13 which means if my competition has a domain authority of 7, then I’m likely going to rank above them. You will want to find your top 5 competitors (the sites that rank in the top 5 positions for your main keywords) and run this test on them. I typically copy and paste the results from this report into a document so that I can compare them all side by side. 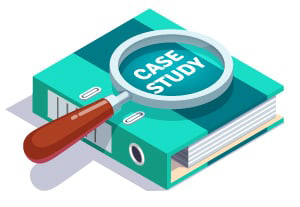 I have found after running this analysis on hundreds of websites that about 80% of the time, the website with the highest domain authority (and page authority but we will get to that) ends up ranking the highest if the on-site optimization is done correctly. That would be things like keyword density, meta tags, etc. So, to apply this to your website you just need to figure out what your DA is and what the DA is of your top 5 competitors and you will have an idea of how your DA stacks up with the competition. If you want to increase your DA, you are going to need to get some backlinks which leads me to my next point! The second thing you will see in the Website Authority Checker report is the External Links To Domain. This is the number of links on the internet that point to your website from other websites. But how do they work exactly? However, not all links are created equal. If you get a link from a website that Google considers to be spammy, it’s not going to help you out much and could, in fact, end up hurting you. So, the idea is to get backlinks from high authority websites withing your niche. These links to your site “pass on” authority from the site that linked to yours. Let’s say Wikipedia links to my site and their DA is 100, I’m going to get a nice little piece of that DA 100 which is going to be passed on to my website. Are links the only thing that determines a websites DA? Well, not exactly. Your domains age actually plays a role in your domain’s authority. To put it simply, Google trusts websites that have been around for longer and it makes sense. They wouldn’t want someone to be able to build a spammy website and do a bunch of spammy backlinking and then rank a week later for a major keyword. The users of Google would instantly lose trust and leave. So, to prevent things like this from happening, Google keeps track of how long your website has been around. 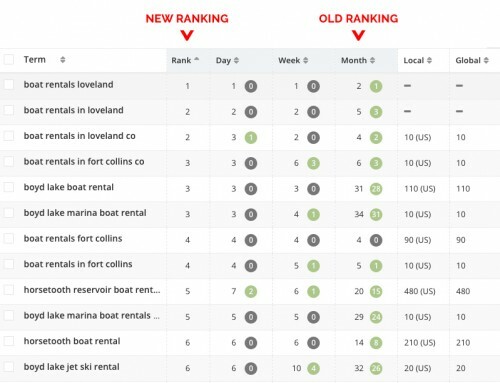 If your website is 1 month old, it’s not likely going to rank for much of anything. As a good rule of thumb, 3-6 months is when you will start to see accurate rankings. So, if your website goes live and you don’t immediately rank for every keyword, don’t freak out. Google is trying to determine if your site is authoritative enough to rank so give it some time. The page authority or PA is how authoritative a page is from a given domain. In the image below, you can see that the authority of my homepage (www.missoulaseogeek.com) is 27 which I’m rather pleased with, considering the lack of work I have done on this site (shhh… don’t tell anyone). But you can see that I have 26 links pointing to this page which is probably why my PA is high. I need more links to the other pages of my website which will increase my DA along with more links from high authority sites in my niche. 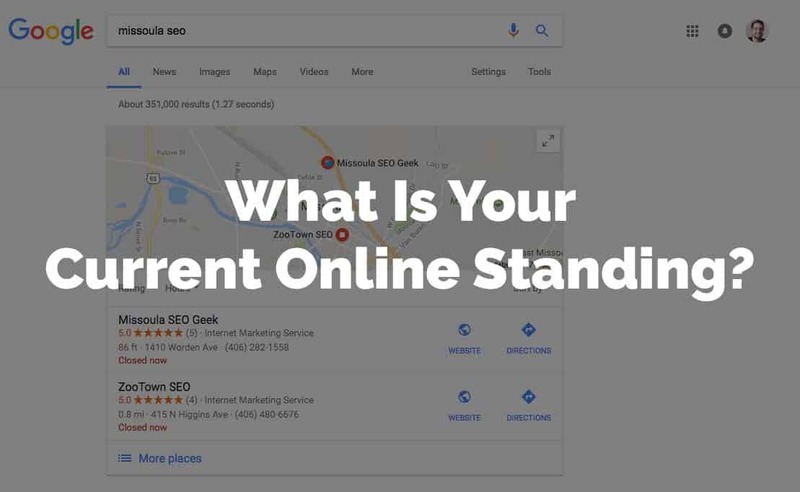 I think this one seems obvious but determining the current rankings of your website and the websites of your top 5 competitors is really valuable. Why is that? Well, it clues you in on ways that you can outrank your competition and take over some of their traffic. My absolute favorite tool for spying on other people’s rankings (and SEO in general) is SEMRush! It gives you so much information in one place that you almost don’t need anything else (besides the Website Authority Checker of course). It lets you see the monthly Google search traffic for the website along with information about backlinks, Google Adwords, and last but not least… Keyword Rankings! However, if you want to see some of the specific information about backlinks, etc. you will need to sign up for an account. Looks like there is a 7-day free trial if you want to just give it a go and see how it works. When you visit their website, you will see a screen like the one below where you can enter a domain that you want to run a report on. I’ve found that just entering the domain by itself works best. By that I mean, don’t use http:// or anything like that at the beginning. You want it to look like example.com because that pulls info for the entire domain. If you use http://example.com/ it’s going to pull info for that specific page rather than the whole website (or all of the pages). Once you hit the start now button you will be directed to the overview page that shows all the stats for the site. I love the graph that you first see which shows that monthly search traffic for the website. This allows you to track trends over the years and it also corresponds with Google updates. 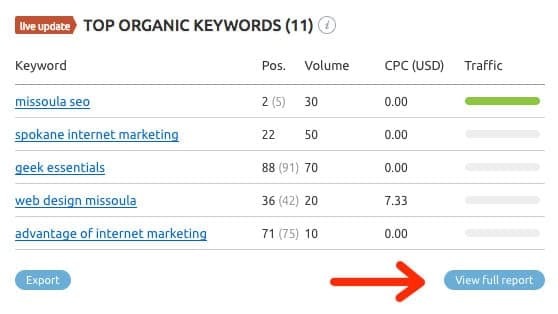 If you scroll down to where you see the keyword report and click on the View Full Report button, you will be able to see a lot more of the keyword statistics. From there you will see little Google logos below the graph which indicate when Google has released an update. If you click on those logo icons you will see further info about the Google update. I have seen where clients Google rankings drop off right when the mobile-friendly update hit for instance because their website wasn’t mobile friendly. You can see right on the graph where the traffic just drops suddenly after being steady for some time. 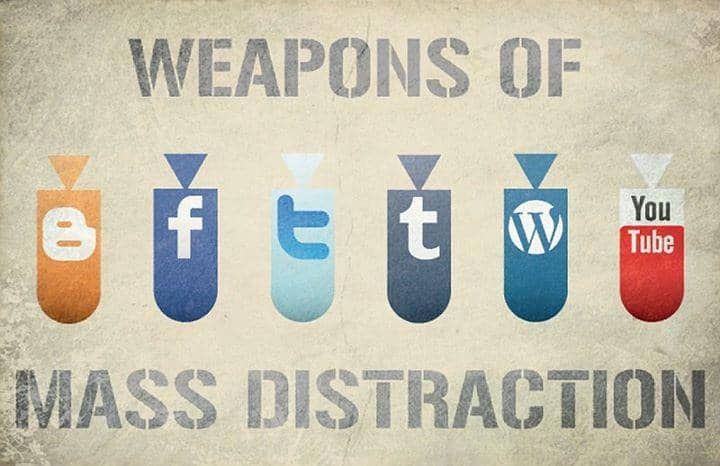 Needless to say, it’s a useful tool. 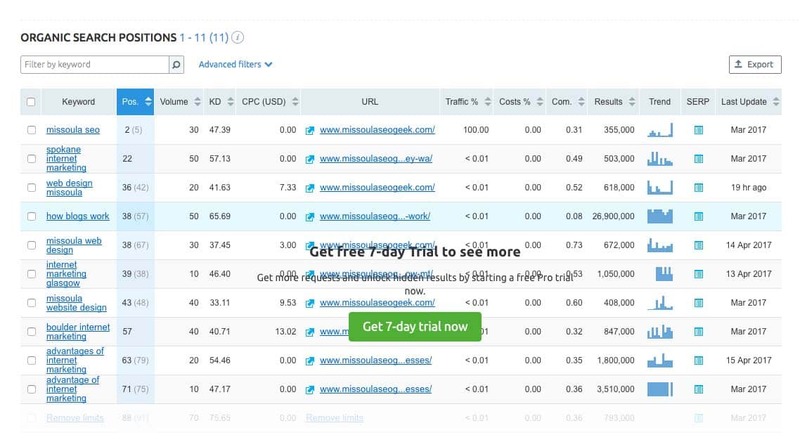 Right below the graph, you will find the full keyword stats report. I like to click on the little arrow just to the right of the Pos. column. That arranges the keywords from the ones you rank highest for the ones you rank lowest for. 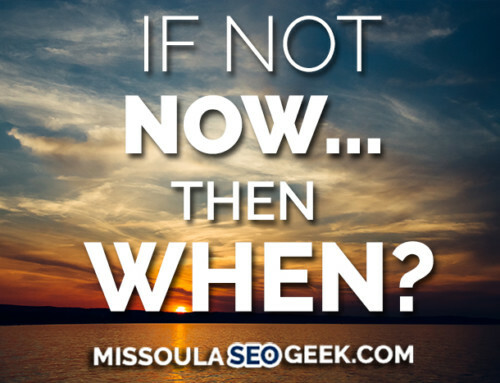 You can see here that I rank #2 for Missoula SEO which is my number one priority as it’s my main keyword. The other ones need work but don’t you worry, I’m on it! From all of that data gathered on your own website and the websites of your top 5 competitors, you should have a really good idea why your site is ranking where it is and what you need to do in order to get your website to the top of the search results. Now, it’s just a matter of doing the work. If you are interested in having someone optimize your website so that it actually ranks in search engines, and converts traffic into leads, reach out to me today! 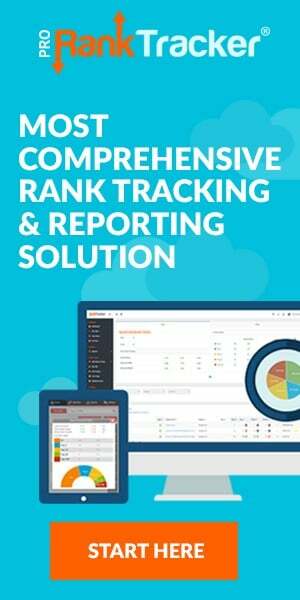 I can walk you through this whole process and show you exactly why your site is or isn’t ranking. From there, I can give you some ideas of what you can do to get your site up to speed. Trust me, I know how difficult this can be, so don’t hesitate to call or email! 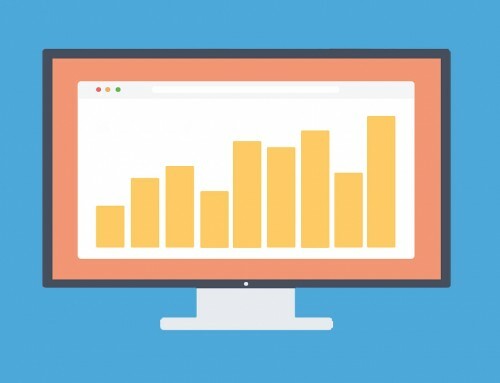 How To Start Benefiting From SEO Strategies TODAY!